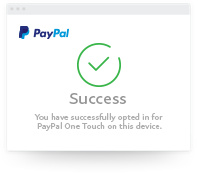 Activate One Touch™ on your PayPal account and skip the hassle of entering your login and card details every time you pay online. Already a PayPal user? Activate One TouchTM. 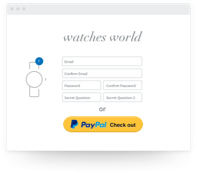 After signing up for your account, activate One Touch™ and you never have to enter your login details again every time you checkout with PayPal. Shop securely on any device, any platform, anywhere. Once you activate One Touch™, you'll stay securely logged in on all your devices for up to 6 months and still be covered by the same Buyer Protection and world-class fraud protection. 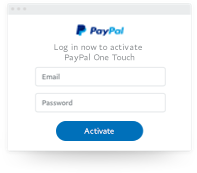 Enter your PayPal login details to activate One Touch™. Now you're ready to shop across millions of stores faster and more seamlessly. It's time to shop faster.